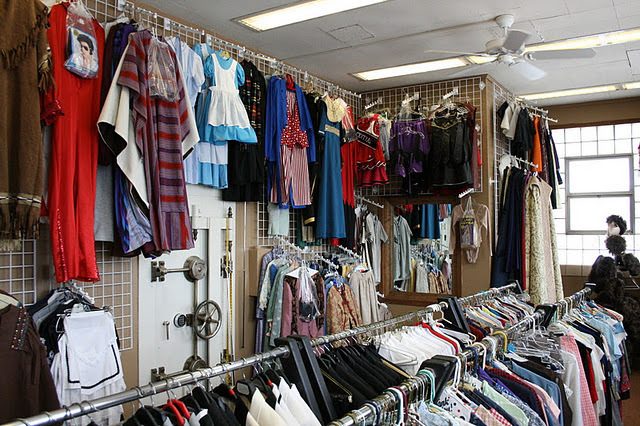 The Costume Shop’s regular hours are Saturday mornings from 9 – 12. Entrance to the shop is located at 901 Main Street, on the east side of the Tulip City Agency Building (which is located on the NE corner of the square). We’re right across from Casey’s. Union Street Players is a non-profit organization and all proceeds from costume rentals are returned to USP for future productions. We graciously accept costume and vintage clothing donations. Basically, we like clothes that are really old, really ugly, really unique, or really beautiful. We’re grateful to the community for making the shop an ever-growing success. Pati Van Zante, (641-780-3190 cell) has offered to voluntarily manage the Costume Shop for several years. Along with Pati, we have an all volunteer staff. Please call Pati to with inquiries. Union Street Players’ Costume Shop will be open extended hours this weekend for all of your trick or treating and Halloween Party needs! The shop is located at 901 Main Street in Pella. You’ll find us on the east side of the Tulip City Agency building across the street from Casey’s on the northeast corner of the square. Friday Oct 26 6:30 to 8:30 p.m. Sat Oct 27 9:00 a.m. to 3:00 p.m.
Mon Oct 29 6:30 to 8:30 p.m.
We will also be open on Thursday, November 1 from 6:30 to 8:30 p.m. so you can return your Halloween rentals. You can also return costumes during regular Costume Shop hours Saturday mornings from 9:00 a.m. to noon. Work Continues Saturday at Costume Shop! Help Needed! This Saturday, November 21, we will once again be hanging grid in the main room upstairs. Volunteers are needed to help scrape, plaster, paint, organize and clean. There is always plenty to do. Please swing by and lend a hand, even if you can only spare an hour! Special thanks to Matt Kelly, Carl Gray, Peggy Moriarity and Mark Moreland for their help in the shop build thus far. Hope to see you all this Saturday from 9:00 till noon. A special thanks to volunteers to gave their evening to being some much needed clean up and organization at the USP costume shop. In recent weeks, it has been decided that we need to make due with our current location. However, we've launched efforts to expand and organize our current space to make it better for customers and volunteers. We've made arrangements with our landlord to rent the large furnace room at the south end of the floor. This will give us a tremendous amount of storage and allow us to relieve some congestion in the other rooms. A washer and dryer are being donated to USP, which will be installed in the furnace room and allow us to launder costumes on sight rather than forcing volunteers to take them home. In addition, we're beginning an on-going process to purge the collection of irreparably damaged costumes and improve organization of other sections of the shop. Volunteers on Monday night included shop manager and USP Walk of Fame member, Dottie McGee. Fellow Walk of Fame Member, Pat Moriarity was also there along with Peggy. Cyndi Atkins, Suzi Jones, Lisa Witzenburg, Tom and Wendy Vander Well also pitched in. There is a tremendous amount of junk in the furnace room that got piled up for removal. Pat and Tom cleaned up one side of the room so that shelves can be constructed. The ladies tackled our large collection of animal costumes. Masks, hoods, tails. paws, were gathered, matched up, and placed in labled storage bags to they can be easily found. It may sound like a simple task, but there was a lot of work to figure out exactly to which animal different body parts belonged. USP treated the volunteer crew to pizza. Thanks to everyone who helped out. Another clean-up day is scheduled Saturday, March 14 from 1:00-4:00 p.m.
People were standing outside the door of the the Union Street Players Costume shop on Thursday when it opened for extended hours. A steady stream of customers packed the shop as trick or treaters rented costumes, adults got costumes for parties, and high school girls picked up poodle skirts for Pella High School’s production of Grease. Do you have your costume?! The costume shop will be open regular hours on Saturday morning from 9:00 a.m. to noon, and the shop will be open next Thursday evening from 6:00-8:00 for extended Halloween hours.